Meghna Jayakumar, our summer intern, had a few adventures this summer. Here is a summary of her time in Brooklyn. Back in June, I was on a trip to New York City to visit a friend, and we found ourselves with no plans on a Thursday afternoon. I assumed there was a children’s museum in the city somewhere, and of course there was one right in the neighborhood. It just happened that the Brooklyn Children’s Museum does a Pay as you Wish afternoon on Thursdays from 2 to 6 pm, so I took advantage of the opportunity and went for a visit. I got a special visitor’s pass from the desk after explaining that I was visiting as an intern. Since I wasn’t visiting the museum with kids, I was looking at everything from an intern perspective, scouting out ideas for Explorium. The building itself is bright yellow, so it stands out in the middle of the Brooklyn streets. Inside, the first thing we walked into was an area made for toddlers. Tiny children were running around playing in boats and cars, shoving their hands into sandboxes, and having so much fun playing pretend, learning without knowing they’re learning. Inside a room separated by a fish tank was a sensory wall and baby-sized climbing structures where even tinier children were crawling from one colorful corner to another, running their hands over the textures on the wall. All the tiny children seemed to love the way everything was made for people their size. In the next room was a nature exhibit that explored local wildlife as well as different habitats around the world. There were small animals in tanks to suit different habitats. There was also a greenhouse that led to an outdoor garden filled with butterflies and local flowers. 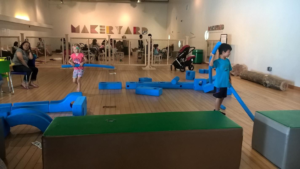 There was a whole water play section downstairs that was too full to explore, but it was the start of summer and all the kids needed a place to cool off. A feature of the museum that I really enjoyed seeing was the bookshelves. Near every exhibit there would be a place to sit, and near every sitting area there was a bookshelf filled with books related to the exhibit. There were books for all ages and reading levels, from simple picture books to short nonfiction books. Wherever I saw parents sitting and relaxing, their nearby kids would either be interacting with the exhibits or reading; there were never kids just sitting around looking bored. After the garden, we walked through a whole section of the museum that was set up to look like a miniature neighborhood. It was an exploration of the mix of cultures that make up NYC neighborhoods, so there was everything from Chinatown-style shops for pretend play to exploring costumes and art in Caribbean parades that happen every year. Each section focused on a different culture, but the whole exhibit did a good job of making it all feel like parts of a whole. 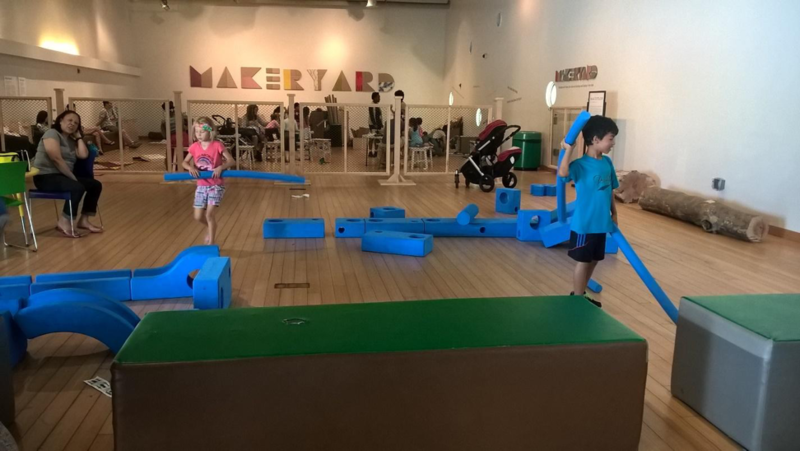 Finally, we made our way upstairs into an open area that was half artifact collections and half tinkering space. 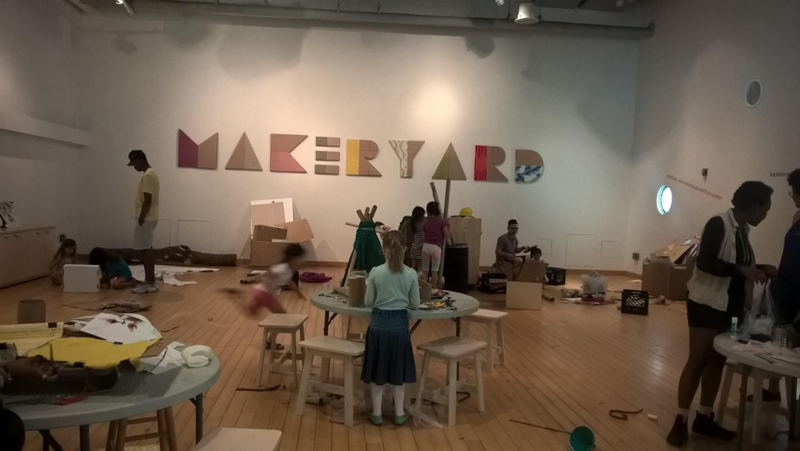 The collections section was fairly bare, because all the kids were drawn to the Makeryard. They were presented with an open space and a lot of materials of all types. I saw cardboard in many sizes, cloth, yarn, paper, and many other things. There was also a part with Imagination Playground blocks that were a big hit. Literally. A group of siblings were hitting each other with the long blocks, but they seemed to be having fun. 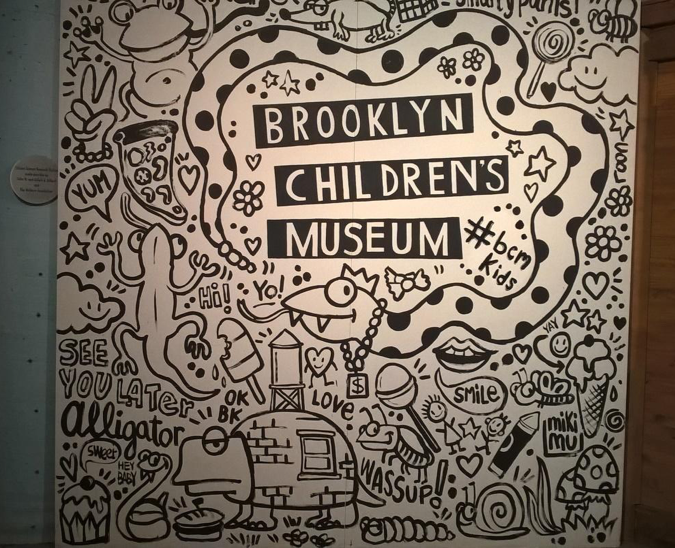 If anyone is in the area, I would definitely recommend the Brooklyn Children’s Museum for a day out with kids!